Location of Punta Arenas and some of the principal gold findings. In Buenos Aires the press portrayed the gold findings comparing it to the rushes of Australia and California. In that city many companies were formed for the purpose of extracting gold. Julio Popper, a mining engineer, was contracted by one of these companies in Buenos Aires. Popper then proceeded to recruit a number of Dalmatians from the many immigrants that lived in Buenos Aires those years. With these workers Popper set out to exploit the findings of El Páramo in San Sebastián Bay. Another camp was established in Sloggett Bay at the southern coast of Isla Grande de Tierra del Fuego. The gold rush reached the Chilean islands south of Beagle Channel so that by 1893 over thousand men, most of them Dalmatians, lived there. However, by 1894 gold extraction begun to decline in these islands and deposits became gradually depleted. A number of enterprises formed in the 1900s to extract gold from the islands south of Beagle Channel ended with meager results. During his work in Tierra del Fuego Popper was involved in the killings of native Selk'nam, which came later to be known as the Selk'nam genocide. Around the island gold diggers, sheep herders and "even police" are reported to have assaulted Indian camps to acquire their women. This created even a shortage of women among Fuegian tribes. The capture and control of women in the main island worsened conflicts between rival groups. There are also reports of trade of women during deals between men. By 1894 Porvenir consisted of five houses, two of them liquor stores and a third one a brothel. The Dalmatians involved in the gold rush gradually left mining activities either to return to Dalmatia or Buenos Aires or establish themselves in Punta Arenas. The gold rush caused an improvement in the geographical knowledge of the poorly known islands south of Beagle Channel and linked them to Punta Arenas. 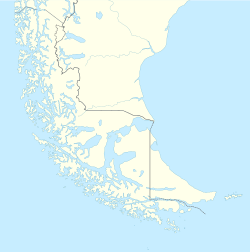 Gold extracted in Isla Grande de Tierra del Fuego generally left the zone without improving much the economy of southernmost South America, but in the case of the gold extracted in from the islands south of Beagle Channel much of it ended up in Punta Arenas where it fueled economic growth. This page was last edited on 1 July 2018, at 20:38 (UTC).